So I arrived back in Prague staying at a cheap hotel, that confusingly goes by two names, in the Smíchov district. I received a couple of separate messages from two erstwhile Haines folks who wanted to get together with me that evening. One, Blair, was only a river guide for one season back in 2005. He’s now married to a Czech girl and has been in town a little while. The other, Shawn, has been circulating in the guide world in Haines since at least the time I moved there in 1996. Most recently he’s been working in heliskiing, those trips into the jagged mountains to drop well-heeled skiers down the untouched vertical slopes of the Chilkat Valley. Shawn has more than a touch of the jaded about him by his own reckoning. 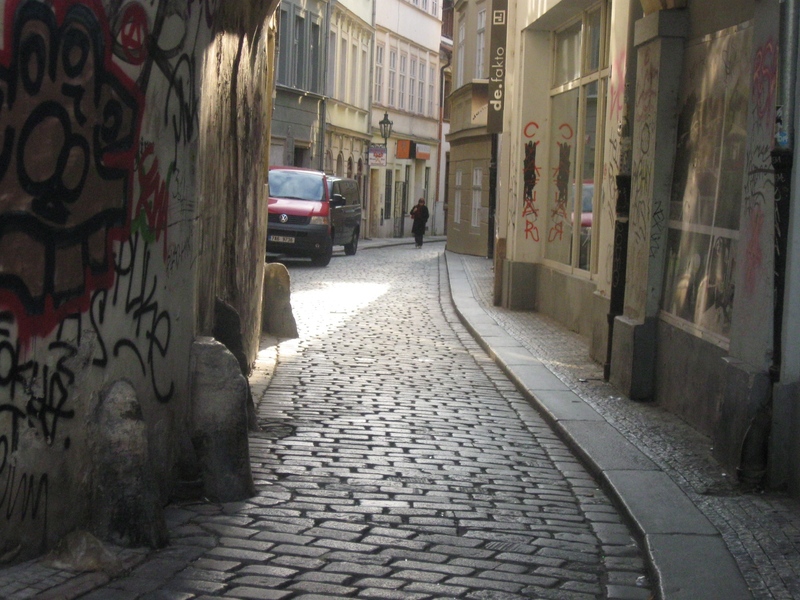 Prague, with its millions of tourists, reminded him a bit of Skagway on a five ship day. He’d already had his big Euro-experience in Munich having his wallet, laptop and soul gobbled up by Oktoberfest. But in fact flying under the radar as he does, he was none too worse for wear. Blair met us at the Jan Hus statue and knew of a place to go for beer and food, a real Czech hospoda called LoKal. The place was jammed with over a hundred Czechs in a smokey cacophony of conversation and laughter. Blair bought us a round of their unfiltered beer on tap as we waited for a table. An affable Canadian girl, Carmen, sitting alone, gave without to much difficulty to Blair’s pleading. And soon the four of us were talking and sampling things from the menu, including the infamous Moravian cheese, which I should warn all cheese fans has the weirdest aftertaste of any dairy product I’ve ever tried. It is cured evidently on rotten beef, or something like that. I would say you get the picture, but you probably don’t. I ate more of the headcheese. Finally I bid them all adieu as I wandered back to my hotel to get some rest after my first day in Prague. 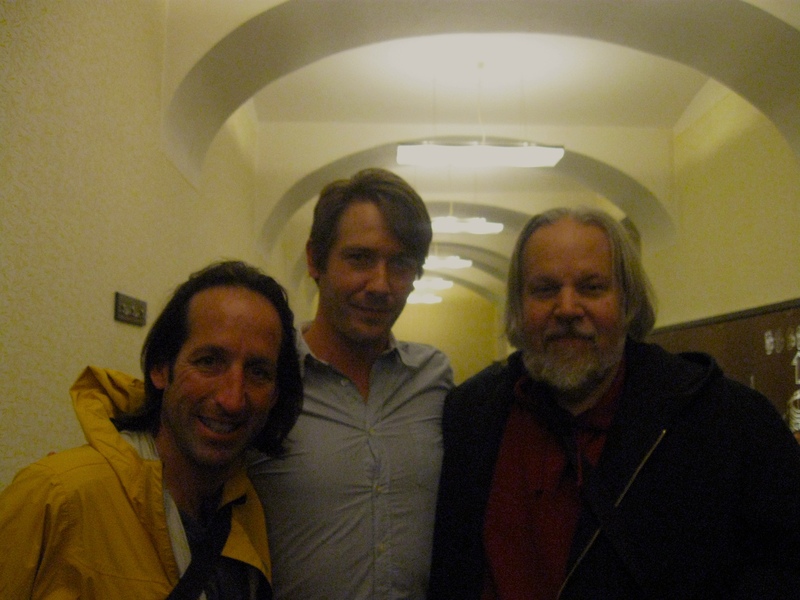 How odd to come back to Prague to meet people you know from Alaska. The next few days were for getting reacquainted with Prague as I waited to find out about my interviews. There was the endless parade of tourists to just get around, in more ways than one. And the endless means of bilking them out of their euros, pounds, dollars, pesos, yuan, rubles, francs and yen. Yes the endless trinkets, the shiny glass baubles, the bad authentic Czech art, the ripoff money exchanges and, of course, the truly inferior puppets made in the Balkans to sell to the euro-rubes. But what really struck me this time was the shopping malls. 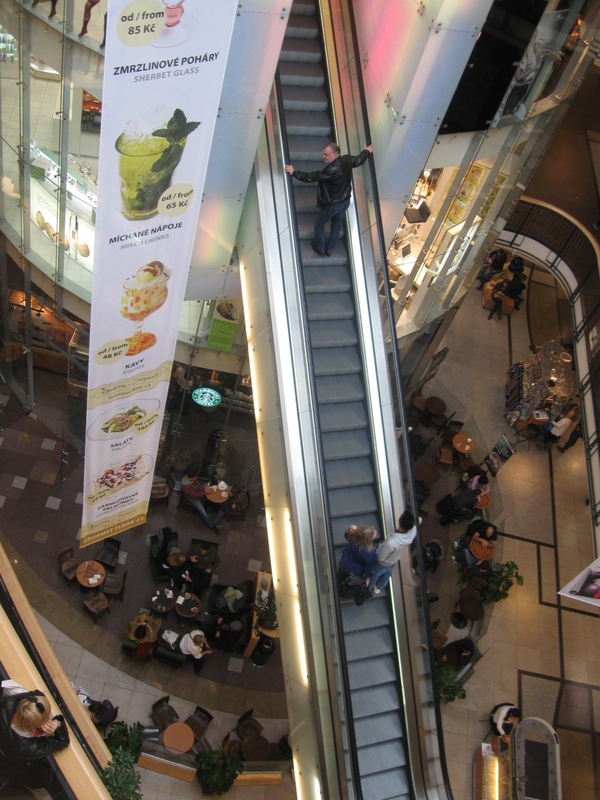 In Krakow, Berlin and now Prague I found huge, sleek, 21st Century malls feeding a hunger for all of the same crap you can find in any American shopping Mecca. There are food courts, cinemas and franchises that certainly are replicated around the world now. All the big American movies were here. The most frightening aspect of traveling now is that you can feel that you haven’t actually gone anyplace at all. And these malls are not for the tourists. I was getting antsy to find the real Prague away from all of this bling and glitz. I knew it was here but I just had to search it out. I’ve been to Prague a couple of times before. I know my way around. This time I bought a month pass and just hopped aboard anything that moved my direction. Mostly I was using the trams. Speaking of shopping, I did have some things to look for while I was here. There were a couple of musicians I wanted to seek out on CD, some visual material on DVD. I am loath to download things if I can get a physical copy. So I found a CD by Radůza, an accordion playing Czech singer I’ve listened to for years. Then I looked Jana Vebrová, also an accordion playing wench, but much more abstract and intense. I lost out on that. But I would continue to hunt around. Sadly it seemed not much of the kind of Czech puppet animation I was looking for on DVD was to be found. Trnka, Barta, all seemed unrepresented, though they had recently re-released Švankmajer’s feature films. Which reminds me… there are the sites and exhibits and other things. And what about the puppets? 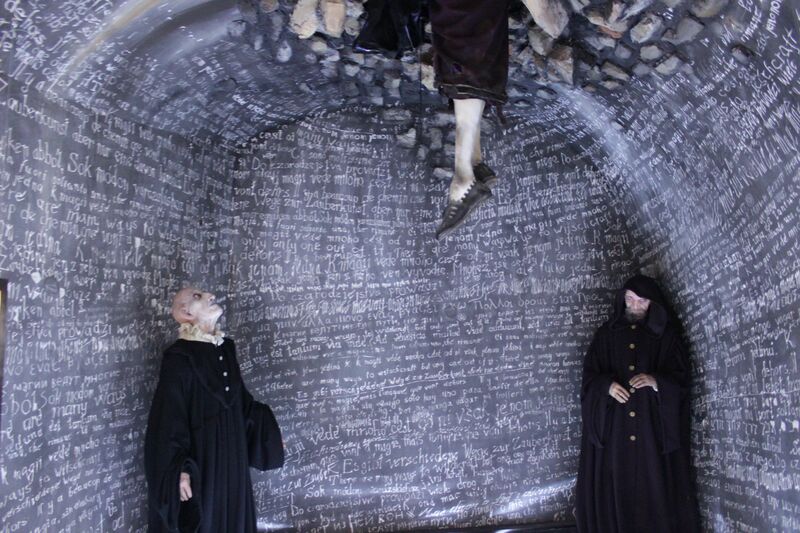 Yes there was an alchemy museum and a museum of haunted Prague. These were just little tourist traps. But the kind I like: Weird mannikins and homunculi, strange dioramas, odd facts, the past faked with dummies and puppets. One dried Baby Dodo Bird coming up! 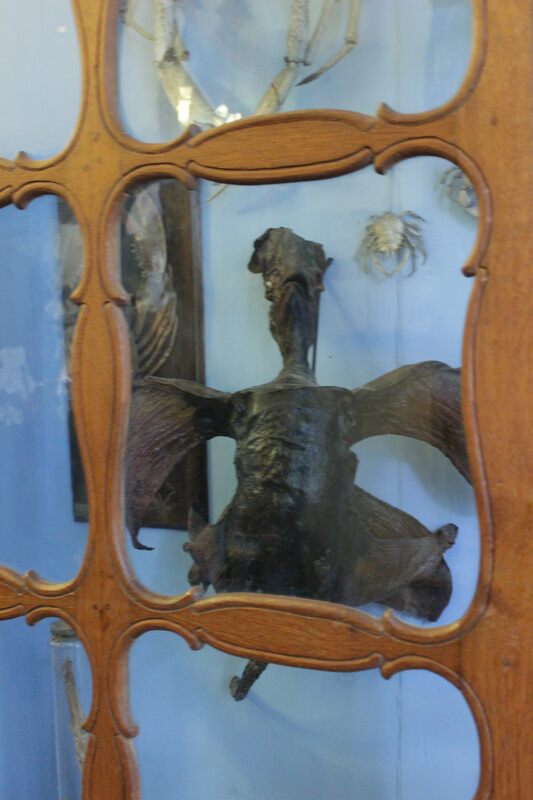 Then there is for me one of the most interesting places in Prague, the Strahov Monastery Library, which besides having a fascinating book collection also has some truly peculiar curiosities in their old cabinets and shelves. And if you really look at the unlabeled items on display, if you get down on your knees and survey the ground level, if you pay attention to what is in front of you you you might see a dried baby dodo bird, books made of wood, a portrait made entirely with seeds, if Švankmajer hasn’t investigated this place carefully I’d be really surprised, and objects that defy any obvious classification. This is indeed the Prague I come to find. 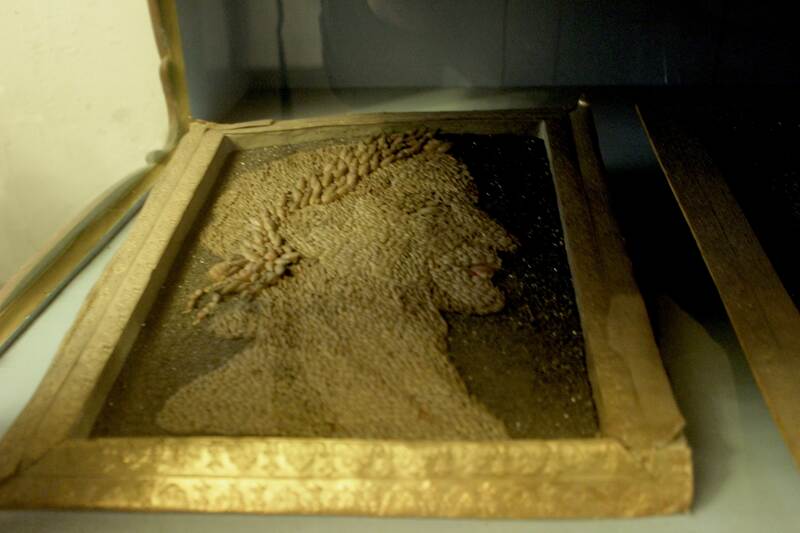 A Mannerist Portrait Made of Seeds at the Strahov Monastery. Finally I went to see a puppet show over at Říše Loutek, which is also the National Marionette Theatre where they show the classic Czech puppet version of Mozart’s Don Giovanni every week. (There is another inferior Balkan version in town, watch out!) 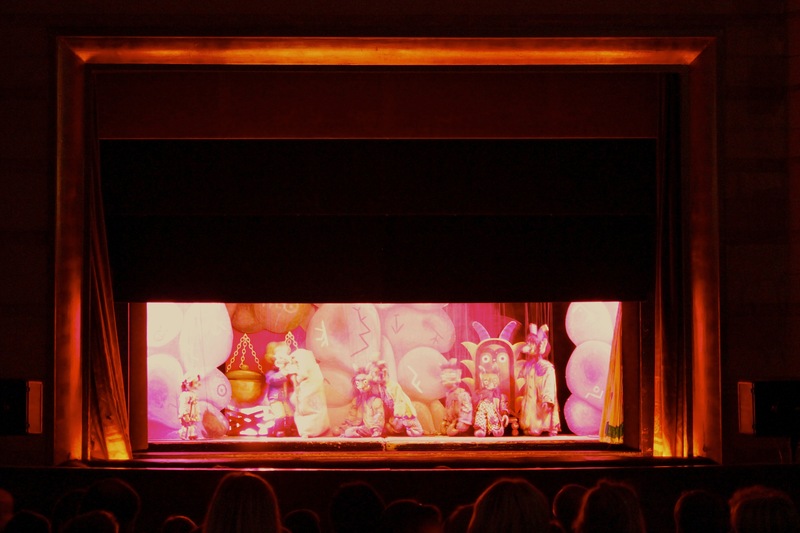 The title of the children’s show was Kašpárek in Hell. For me that’s a promising title. And it was enjoyable. But alas Kašpárek as seen better days. He was now just a little rascally hero. Not the sarcastic truth telling fool of the past. Nevertheless the devils in the piece were worth a watch. And who better to start my Czech puppet shows with than with Kašpárek, the quintessential Czech figure. Kašpárek in Hell at Říše Loutek. A fluffy little adventure for kids. 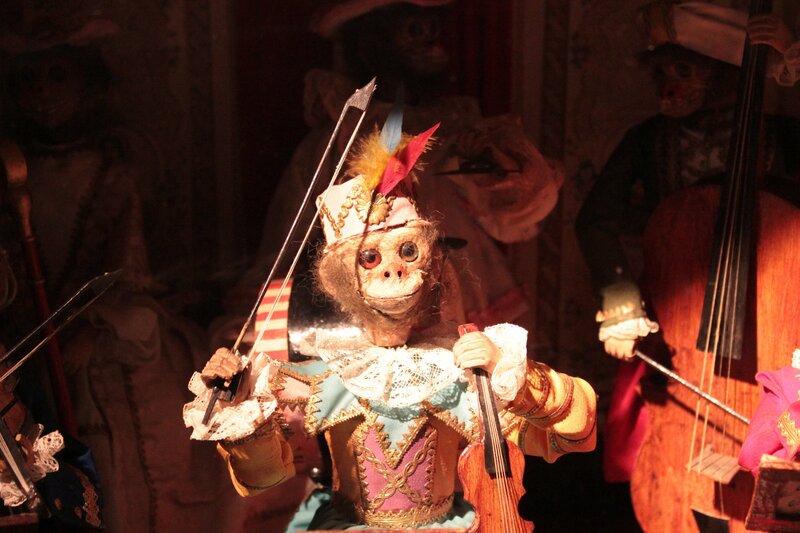 But ironically the real puppetry display was over at the Czech Museum of Music. 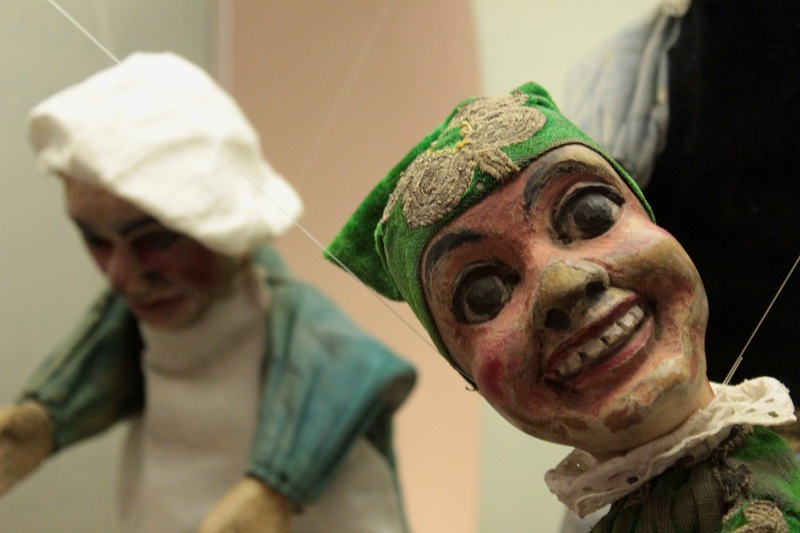 They had a serious exhibition of mechanical musical instruments and automata. Many of these creations from the last three hundred years were marvels of ingenuity. There were player pianos, barrel and pin band organs and various humanoid puppets and animals… including cousins to the puppets that Švankmajer used in the opening scenes of Rakvickarna (Punch and Judy or The Coffin factory). Engrossing. More and more I was seeing Prague through the tourists. I didn’t mind them anymore. Let ’em wander. Maybe some of them will actually begin to see the statues on the Charles Bridge or be tempted to stroll off down a forgotten corner or a twisting alley, and there are more corners here than there are tourists. I felt at home in this haunted city. Oh yeah… I almost forgot. After going to one CD store after another, no one had the Jana Vebrová album. Finally I saw one more place off the tram out of way. I found it again later. I looked through the racks and didn’t see it. Finally I asked. There was a pause… Yes! They had it. What can I say… A moment of victory and worth the effort to find.